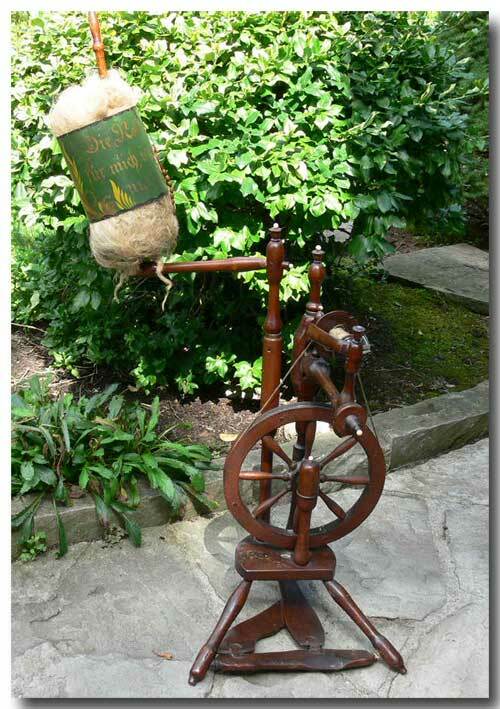 THIS GERMANIC FLAX WHEEL WAS FOUND IN NOVA SCOTIA BUT OF EUROPEAN ORIGIN AND LIKELY FROM THE LOWER SAXONY AREA OF GERMANY. 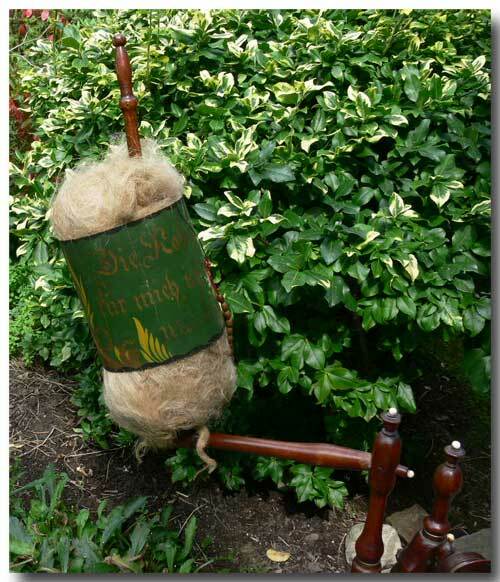 IT’S MOST DISTINCTIVE FEATURE IS THE DISTAFF DRESSED WITH FLAX WHICH IS HELD IN PLACE BY A STIFFENED DARK GREEN STIFFENED PAPER KUNDELBUND DECORATED BY HAND WITH A WAVY BLACK BORDER, YELLOW LEAVES & GOLD TULIPS WITH THE MOTTO “DIE ROSE SPRICT FUR MICH, ICH LIEB ALLEIN NUR DICH” (THE ROSE SPEAKS FOR ME, I LOVE ONLY YOU). THE ENDS OF THE UPRIGHTS & POSTS ARE CAPPED WITH IVORY FINIALS. 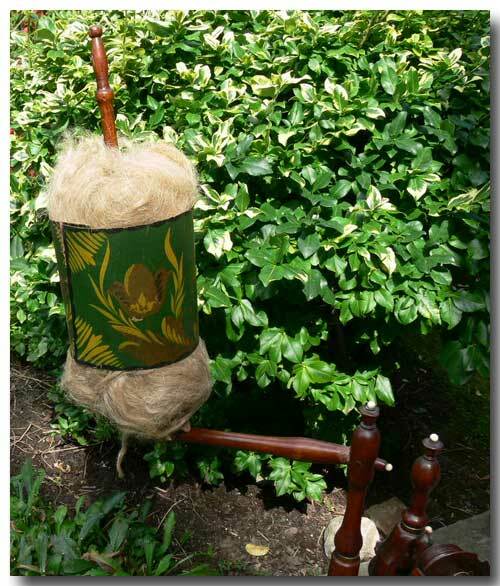 WITH FLAX REMOVED YOU’LL SEE A BELL-SHAPED DISTAFF WHICH IS TYPICAL OF THE HANOVER REGION OF LOWER SAXONY. JOINTS ARE PEGGED. A STRING OF WOODEN BEADS ATTACHED TO A WIRE IS INCLUDED. THE CROSSPIECE ON THE BASE AND ONE LEG HAVE BEEN REGLUED. APPROX. SIZE IN INCHES: 44 ½” X 15 ½” X 15 ½”. DATES IN THE 1800-1850 PERIOD. ONE OF THE 8 IVORY CAPS IS MISSING. ONE FOOT AND A BOARD ON THE PEDAL BASE HAVE BEEN REGLUED. A COUPLE OF THE JOINT PEGS ARE OUT. OTHERWISE IN GREAT CONDITION AND COMPLETE.